Tonight, President Obama will host the final state dinner of his tenure in honor of Italian Prime Minister Matteo Renzi. Behind the menu? 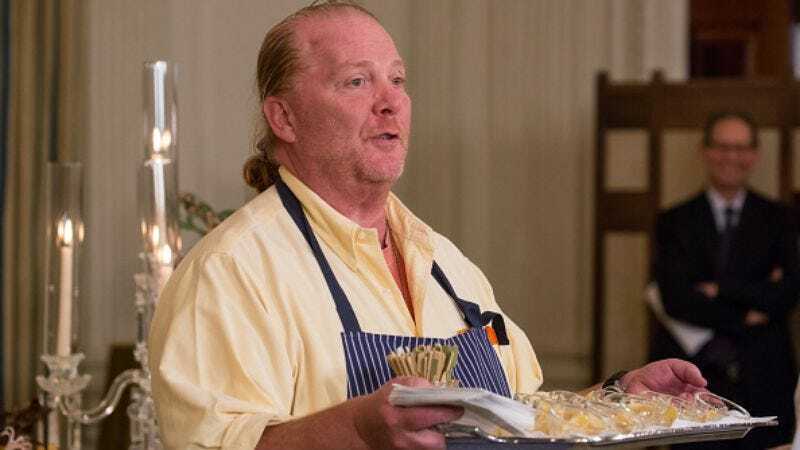 Mario Batali, the charismatic chef who made a name with his Food Network series Molto Mario, his Michelin-starred Babbo restaurants, and the chain of Eataly marketplaces he founded alongside Italian culinary scion Joe Bastianich. Michelle Obama privately met with Batali last month to plan the four-course menu, which was recently released by the White House. Batali found inspiration in some of FLOTUS’ favorite foods—sweet potatoes, steak, and broccoli, among others—and was instructed to honor the Obamas’ longtime support of local, sustainable cooking. The resulting menu is described as highlighting Italian dishes that have been “ingrained in American cuisine, and opens with ravioli-like agnolotti with butter and sage before segueing into a salad of warm butternut squash with frisée and NY State Pecorino Romano. Entrees of beef braciole pinwheel are followed by buttermilk sorbet and a crostata with green apples that were harvested from local orchards. A selection of autumnal petit fours include orange fig slices and a sweet corn crema and blackberry cup. Dinner will be served in a massive, candlelit tent erected on the White House’s South Lawn. Chandeliers, handmade glassware, and neo-florentine charger plates constitute the décor, which the White House describes as being “inspired by an Italian design technique called Fresco, meaning ‘fresh’ in Italian.” Gwen Stefani is set to perform after dinner, as is a group of acapella singers from a nonprofit organization backed by Rosie O’Donnell. Batali told CNN that he’s most worried about the 200-yard trek from the White House kitchen to the massive dining tent on the South Lawn. “If there’s one thing that I’m not going to sleep well about tonight, it’s only going to be the hot plates,” he said. He’s also hoping to impress teenagers Sasha and Malia Obama, telling Eater that “[k]ids are the ones who tell you exactly how it is.” Let’s hope they tell him to swap out those orange Crocs for some wing tips. As of now, Batali says they’re staying on. Batali is by no means the first celebrity chef to helm a state dinner under the Obamas. Culinary icons and Food Network stalwarts like Marcus Samuelsson, Rick Bayless, Anita Lo, and Masaharu Morimoto, among others, have all had a turn. Who else thinks the Obamas never missed an episode of Top Chef Masters?